Christmas is this week! I can't believe it's coming up so quickly. I am squeezing in one last Christmas project to share today. I created this tag using Sweet Stamp's Mr. & Mrs. Snow Duo and the Fancy Leaf Sweet Cuts die. I stamped the snowman using Memento Tuxedo Black then colored him in using Copic markers. The leaves were cut multiple times to create the wreath. 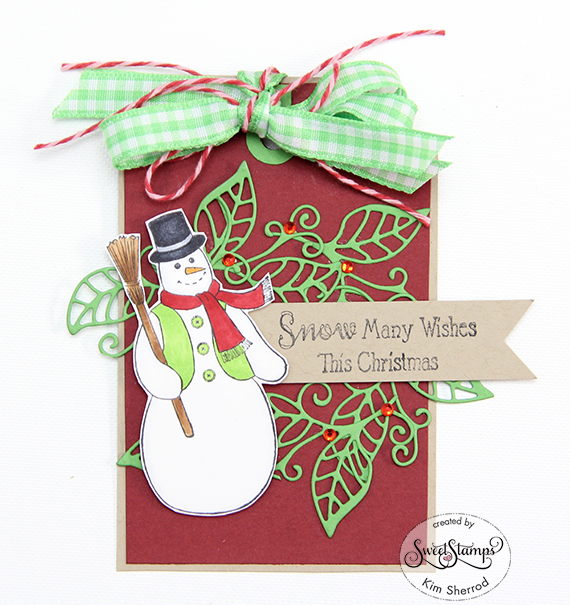 I then added the sentiment and popped the snowman on the front of the tag using 3D tape. The last thing was to add the ribbon, twine and rhinestones. Such an adorable card----I love snowmen! Thank you for joining us on the HIMCR blog! Happy Holidays! Very cute snowman, love that bow! Hope you had a lovely Christmas. Thanks for joining us at Stamping Sensations. Thank you for sharing at Penny Black and more Challenge. Gorgeous Christmas card! I love the details! Thanks for joining us this week at HIMCR!